The Boca district, on the west side of Buenos Aires, is home to the famous Bombonera (chocolate box). La Bombonera is the home stadium for the world-renowned Boca Junior Football team (soccer for the confused North Americans out there) and is home to HUGE names like Diego Maradona – who played with the team throughout his career and who is arguably one of the greatest football players of all time. Two days ago, I had the pleasure of touring the Bombonera stadium and was amazed by the feel of the place. The blocks surrounding the stadium are fully dedicated to the team. Bars, restaurants and souvenir shops, all painted in the infamous blue and gold colours, sport flags and signs and give the neighborhood an exciting, but focused, atmosphere. Even without a game on this month, you can feel the craziness; broken beer bottles line the sidewalks for blocks, and with the small, windy streets you can see how a crowd would be pushed through the area. Inside, the stadium is tiny. At first I was shocked by how intimate it all was. Don’t get me wrong, the place still holds 50 000 fans, but I guarantee safety regulations in Canada would half that number. The fans are divided, not by priced sections, but instead, by how crazy they like to party. Any actual seat in the stadium is considered “preferred seating”. Because the field only meets minimum size requirements, every seat has pretty much the same view. So fans that prefer to sit and enjoy the game quietly are placed in the seats along the length of the field; whereas, the fans that want to riot while watching the game are placed behind the goal, on the second level, next to a giant painted number “12”. These fans are considered the 12th player of the game. They will literally involve themselves within every call, every kick, and every move a player makes on the field. They will shout obscenities, call out to their teammates and personally attack a referee for making a bad call by shouting about his mother or his sister! The lower level of the arena offers a standing room only section: one on each end of the field. Each space was apparently meant for 2000 fans (although I can’t imagine how). Turns out, the areas each fit 5000 standing fans: 2 1/2 TIMES the original capacity. No wonder people are trampled to death when riots break out! Of the 50 000 fans, only 3000 seats are allotted for the opposition. They have to sit on the top floor, and are denied any and all luxuries; they enter from a separate door; they have no shade, no hot water nor any of the amenities granted to the home team fans. Their section is surrounded by giant walls of glass, topped with barbed wire and chain-linked fence to separate the two groups. The entire debacle is absolutely insane. Just standing within the stadium walls one can imagine how moving, and passionate, and out of control the big games against Boca’s arch enemy River would be. The stadium is clearly Argentina’s pride; that much is evident in every detail put into the stadium (and the museum that sits in the lobby). I am definitely lucky to have stood in the stands where so many fans have cheered for Boca, and I am hoping so much we get to catch a game there in May on our way back through Buenos Aires! 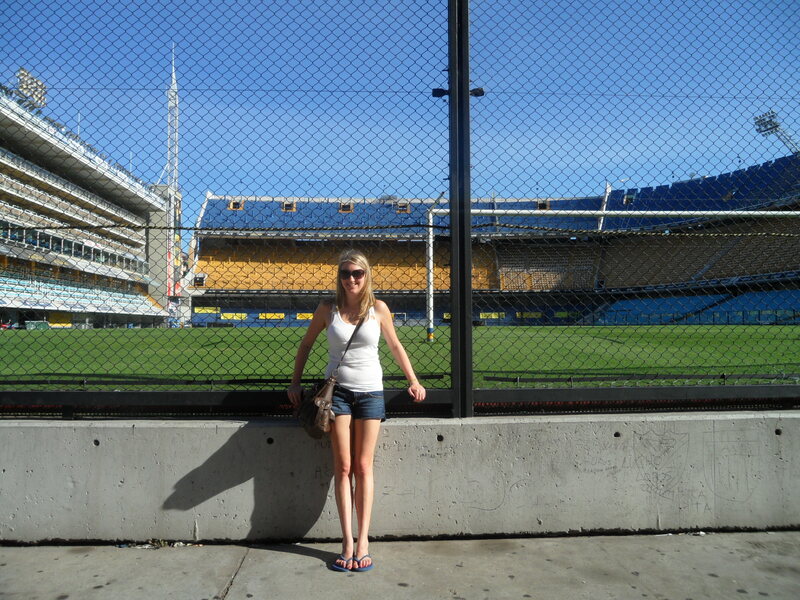 This entry was posted in Argentina, South America and tagged Argentina, Boca, Bombonera, Buenos Aires, Soccer, South America, Stadium, Travel by hilarylust. Bookmark the permalink. Boca Juniors is one of the top soccer clubs in South America and the world. Los Xeneires lost Corinthians in the Copa finals. This is Timao’s first Copa crown. It is called the Bon Bon box. If you get a chance see River Plate. They are the other top club in Argentina and South America. Los Millionairos made it back to the big boys league just this year.